How much should you budget for a trip to Iran? Due to fluctuating currency, it’s can be pretty unclear how much a trip to Iran will cost you. But yet, due to the US sanctions it’s not possible to withdraw money in Iran. Meaning that you are obliged to bring enough cash into the country. To help you budget your trip to Iran this blog post covers the current basic costs of travelling to Iran. According to backpackers, mid-range and luxury travel needs. 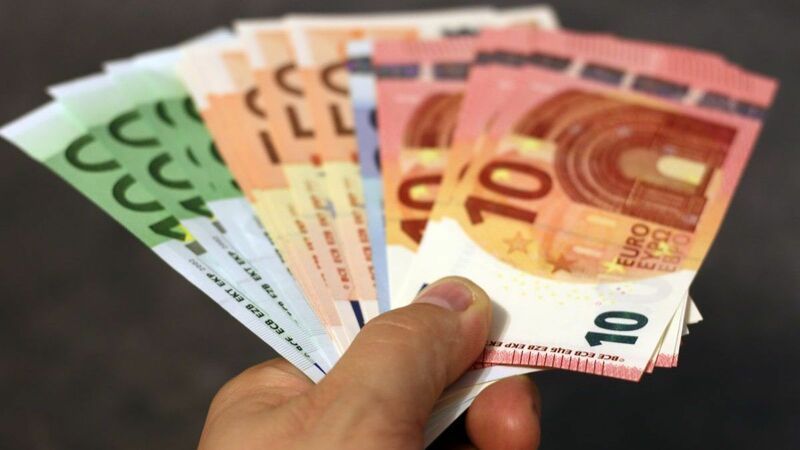 As prices for tours and accommodation are often quoted in Euro’s, while prices for transport and food are usually quoted in Rials I’ve used both Euro and Rials in this article. Given the fluctuating exchange rates, I’ve used the current rate of 1 euro to 150.000 Rials. For accurate exchange rates check this site. 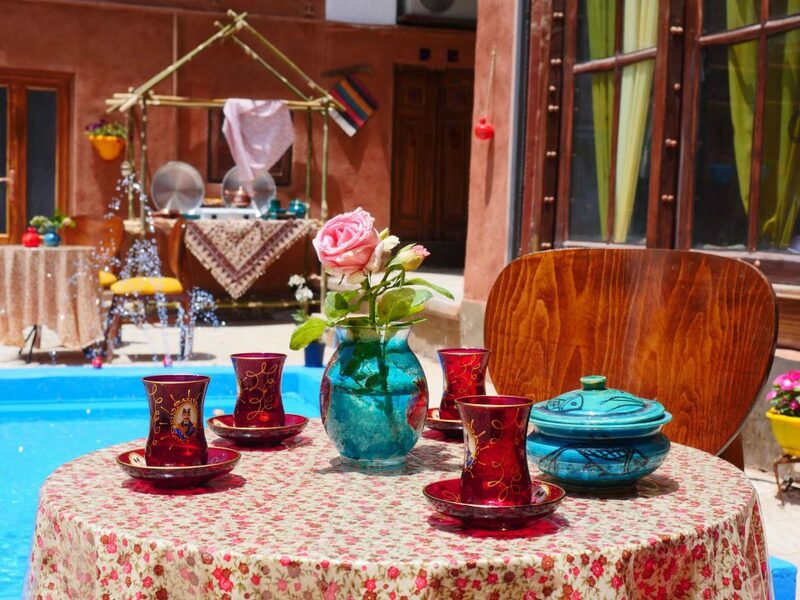 With quality low-budget hotels and hostels spread around Iran, it won’t be difficult to find an economic room for your stay. With dormitories available for as little as 4-10 euro’s per night, accommodation sure doesn’t have to break the bank. 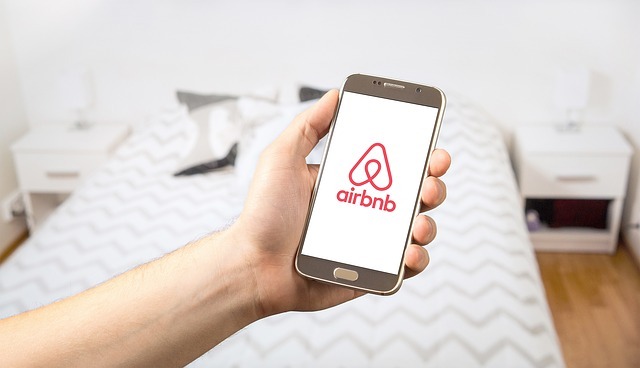 Those looking for affordable private rooms can also consider their-selves lucky; a basic, clean double room with private bathroom can easily be found within the 15-25 euro range. 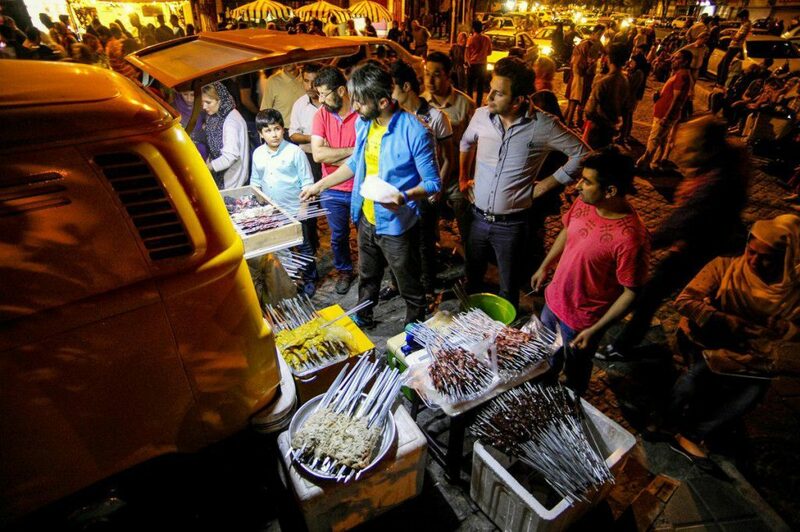 With street food such as falafels and Khoresh Kebabs (soup with meat) available between 40.000 and 150.000 Rials, it’s not hard to find yourself filling snacks. And they are often large enough to be considered a meal. 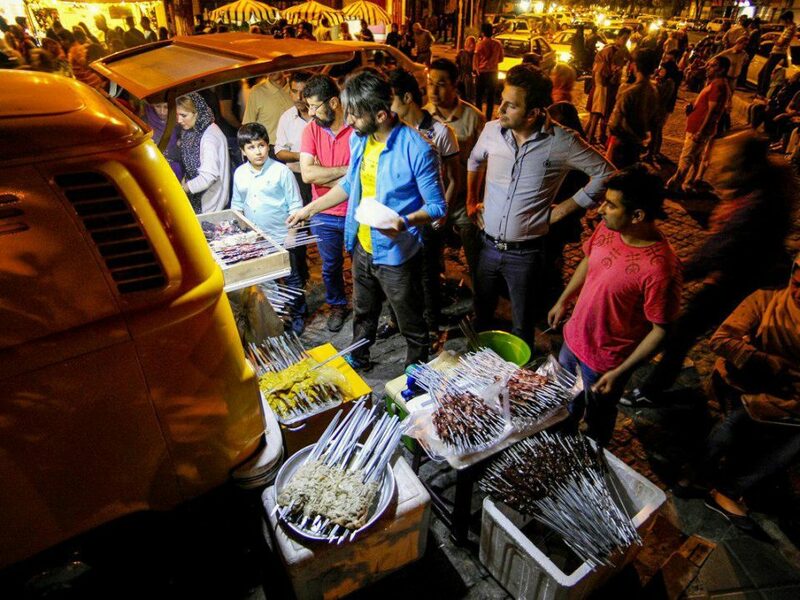 In addition, low-budget restaurants generally charge between 150.000 to 200.000 Rials for a meal. With the current exchange rate that is as little as 1 euro to €1,35 per meal! Add some snacks like biscuits, nuts, water, and juice for around 150.000 to 200.000 Rials per day and you’re good to go food-wise. 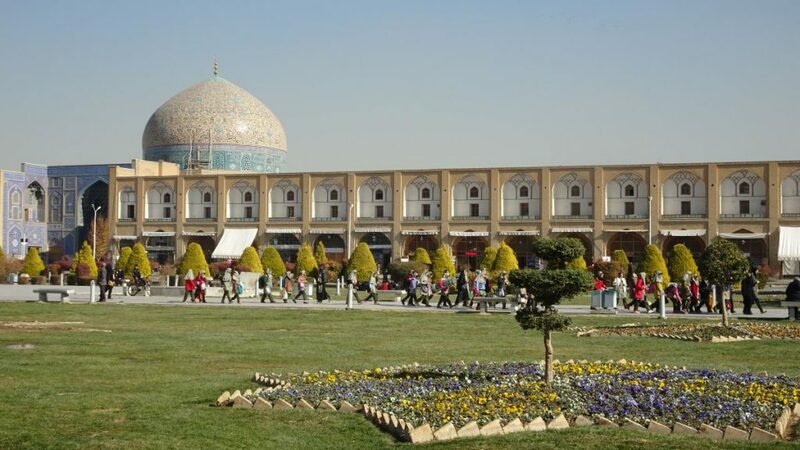 Practically all entrance fees for mosques, Persian gardens, historical homes or historical places charge an entrance fee between 150.000 and 200.000 Rials. High-quality VIP buses are an easy, flexible and comfortable way to travel between cities. While short VIP busses normally charge around 150.000 Rials for 3-hour journeys. 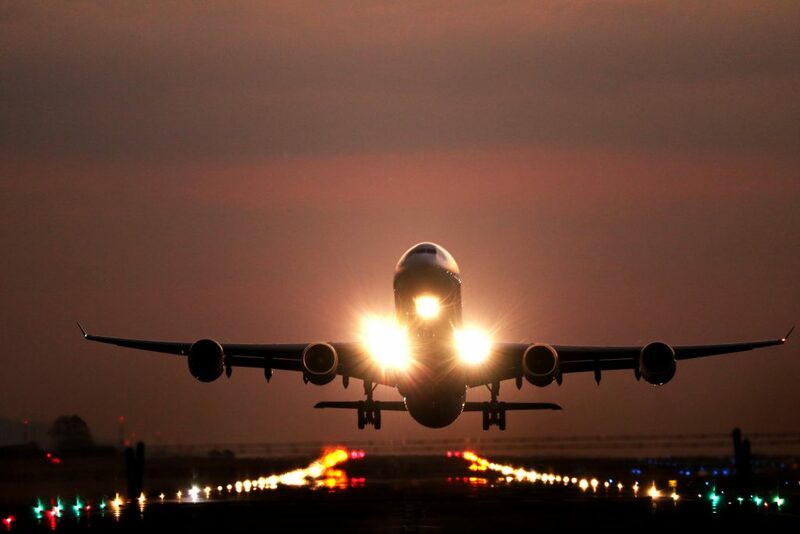 Longer trips are more likely to cost somewhere between 400.000 to 700.000 Rials. Given the current exchange rate that would still mean that you only pay €4,60 for a nine-hour bus journey in a comfortable bus. Not at all a bad deal, I’d say! Inside cities, it pays off to use the Snapp taxi app if available or to make use of regular taxi’s. For short rides expect to pay somewhere between 50.000 and 150.000 Rials. Let’s consider that you’ll spend a maximum of €10 euro’s per night in a hostel and around 800.000 Rials for breakfast, lunch, dinner and snacks. As well as visiting three sights for around 600.000 Rials. Getting there by taxi will cost you another 300.000 Rials. Add a 500.000 Rial average for intercity transport and you’ll come to a daily budget of just €25 euro per person per day! If you sleep in €4 euro dormitories, feed yourself on street-food mostly, and cut down transportation costs by spending more time per city you can travel for as little as 15-20 Euro per day! Those looking for a bit more comfort, space or atmospheric ambience can book a double room with private bathroom for around 20 to 40 Euro. Architecturally interesting rooms can be found in renovated traditional houses, some of which are easily up to 200 years old! The ambience is often warm and sometimes you’ll find beautifully decorated patios or gardens on the property. As if you’ve just walked into a small, cosy, Persian fairy-tale. 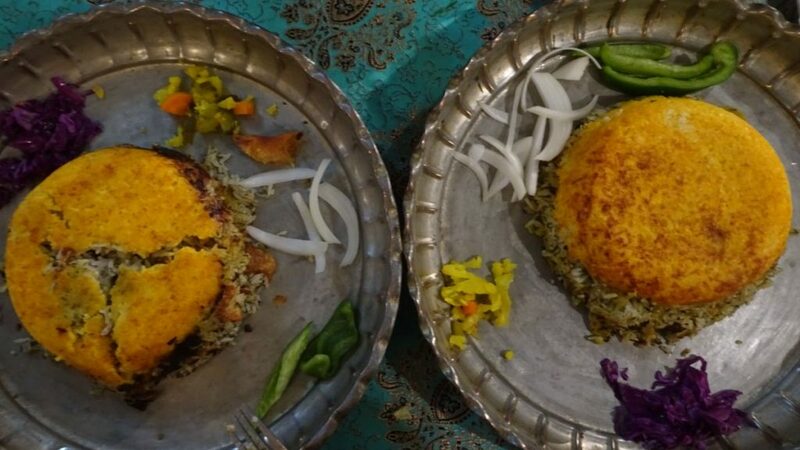 Mid-range restaurants can be found all over Iran. Get a delicious traditional meal or a simple but tasty kebab with rice and pickles for about 200.000 to 400.000 Rials per meal. 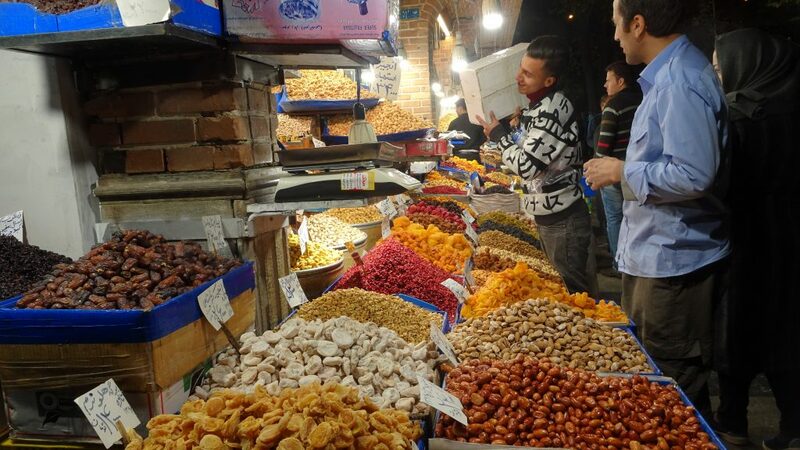 Add 500.000 Rials for some snacks and delicacies from the bazaar, such as fresh nuts, dates, dried fruit, fresh fruit juice or local ice cream and you’re all set for the day. Practically all entrance fees for mosques, Persian gardens, historical homes or historical places charge an entrance fee between 150.000 and 200.000 Rials. Additionally, guided tours, such as dessert tours or overnight hiking activities add up to the travel bill generously by 30 to 80 euro’s per activity per day. Similar to the backpackers budget (see above), the VIP bus is an excellent way to travel between cities. Use the Snapp taxi app or regular taxi’s to go to sightseeing destinations. If you are on guided tours, transportation is included and sometimes includes intercity transport as well. For example; in Kashan, there are lots of guides who offer a day tour to Abiyaneh, with a drop-off in Isfahan. To learn more about booking flights in Iran check this website with information. Use the MahCard to book your flights while you’re in Iran. Given that the costs of a room can be divided between two people, let’s say you spend 20 euro’s per person on your room. Add around 1.700.000 Rials for generous meals and snacks throughout the day. As well as 600.000 Rials for visiting three sites. Add some 300.000 taxi costs and 500.000 VIP bus transport and you’re likely to spend around €40,- per person per day. Please note that guided tours and domestic flights are not included in this budget and should be added accordingly. 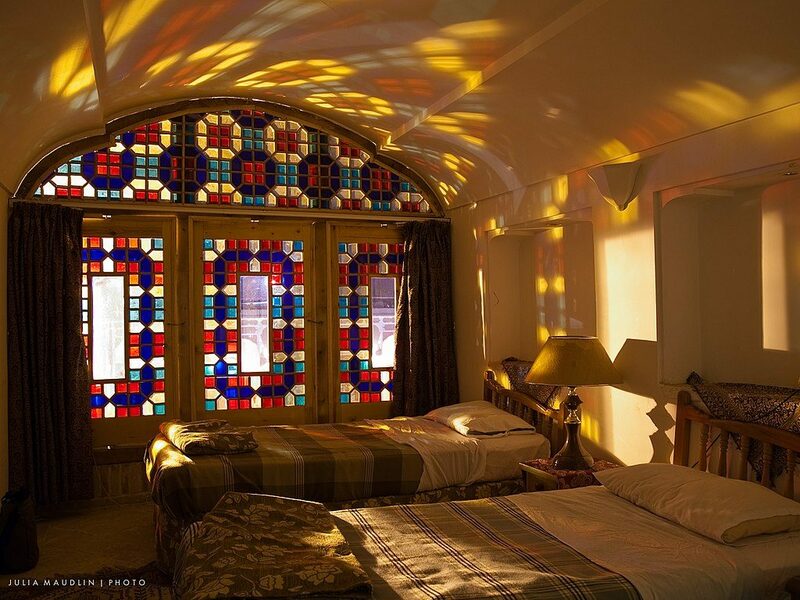 Those looking to indulge their-selves with luxurious rooms have enough choice in Iran. 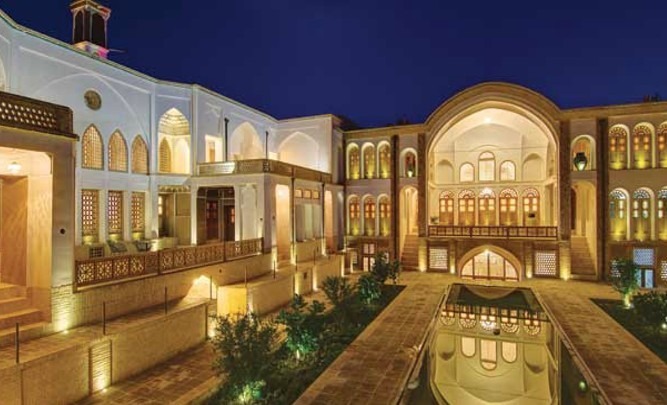 From beautifully renovated traditional houses to exquisite boutique hotels; finding clean, spacious, high-quality hotel rooms with excellent service can be found in every city in Iran. Generally priced between 40 and 80 euro’s, you can find a luxurious room for a relatively low price. High-end rooms are also available but expect to pay into the hundreds for a room like that. With many upscale dining options available expect sense-tingling meals for a mere 400.000 to 600.000 Rials per meal. Add another 500.000 Rials on snacks such as nuts, fresh fruit juices, local ice-cream and dried fruit and you’re sure to have a delightful day ahead of you. Similar to the Mid-range and backpackers fees, expect to pay between 150.000 and 200.000 Rials for entrance to mosques, rich gardens, historical homes and historical places. Pay another 30 to 80 euro’s per activity per day for guided tours, such as dessert tours or Island tours. Travelling on a luxury budget allows you to explore the country in several ways. Similar to the Mid-range (see above) travellers you could use luxurious VIP buses and/or domestic flights to come around. Another option is to travel by private taxi, or by rented vehicle. Private transportation including driver, fuel and toll road and drivers accommodation and meals can be hired for about €55,00 to €70,00 euro per day. Local taxi drivers are often happy to help out for about 25-40 euro’s, depending on the destination, road and travel time. Given that the cost of a room can be divided between two people, let’s say you spend 30 euro per person on your room. As a generous breakfast is often included, you can budget around 1.700.000 Rials for exquisite meals and snacks throughout the day. As well as 600.000 Rials to visit three sights. Add 300.000 Rial taxi cost and you’re likely to spend around €50,- per day. Please note that guided tours, domestic flights and private transportation are not included in this budget and should be added accordingly. Many travellers will like to buy a sim card with data in Iran. Expect to pay around 160.000/ 310.000/460.000 Rials for 1.5/3/5GB data with Irancell. Read all about getting a SIM card in Iran here. 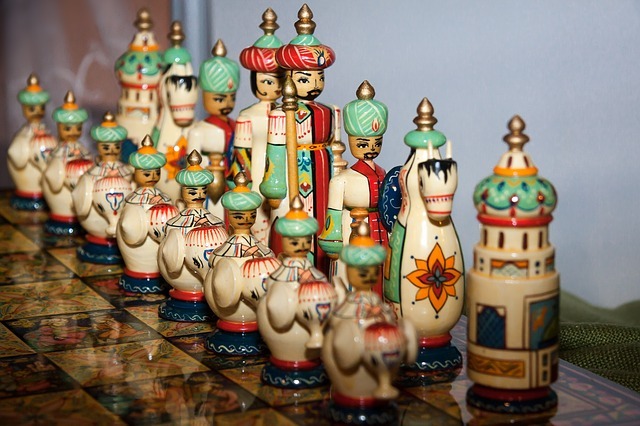 Souvenirs; while some people don’t buy anything, others love to spend a lot on souvenirs. Iran is famous for beautiful, handmade souvenirs such as minakari, pottery, ceramic tiles, textile work and of course carpets. Prices range between 5-10 euro for small ornaments to hundreds of Euro for carpets. A one time fee of €19,- if you like to use the MahCard during your stay. Overall conclusion; how much does it cost to travel to Iran? Travel to Iran can be done according to different budgets. From a backpackers budget of 20 to 25 euro’s per day to a mid-range budget of €40 and a luxury budget of around €50+ per day. All these prices include accommodation, entrance fees to three regular sightseeing places, food and snacks and basic transportation only. For extra guided tours, such as dessert trips, hikes, camping etc. budget an additional €30 to €80 per tour per day. And for other transportation, such as domestic flights or private transportation add according to the prices mentioned above. As you can see a trip to Iran can be quite affordable and is most definitely an experience you will not forget! However, it’s always advisable to check the current exchange rate to check if the prices are still accurate! Be mindful that at the time of writing 1 euro equals around 150.000 Rials. How did you budget your trip to Iran? Did you carry loads of cash or did you use the MahCard to your convenience? We’d love to hear it through the comment section below. Priscilla Versteeg is a long-term traveller with a passion for finding unique nature, places and people in the world. 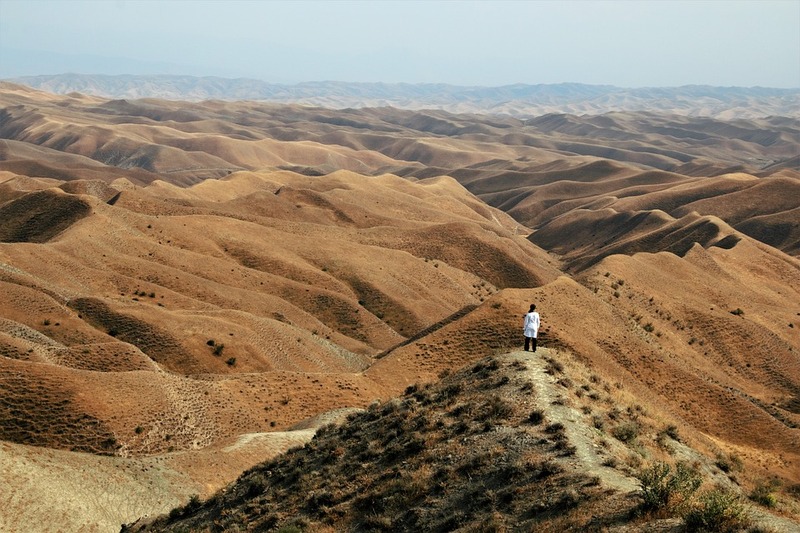 After spending over nine months living and traveling in Iran she’s happy to share first hand travel tips, stories, pictures and advice about this beautiful county. Besides writing for MahCard she also shares inspiring travel stories and unique travel tips about exciting destinations in Asia on her own website. Feel free to read some of her stories on www.discoverworldplaces.com or to send her a message any time. How many Rials would you recommend for a 10-day group tour to Iran? The hotels are already included in the tour price. I would need enough Rials for lunches, dinners, snacks, entrance to popular sights and overseas calls to Canada. Oh, and souvenirs, of course. I would just buy little souvenirs. No carpets. Hi Ron, thank you for your question! If you count on 30 euro’s a day (at today’s rate that’s 4635000 Rials) you should be fine! To cut down cost on international phone calls I’d use either free hotel WIFI or cheap data to make internet phone calls. Or make use of Skype credit to cut down the costs to a minimum. 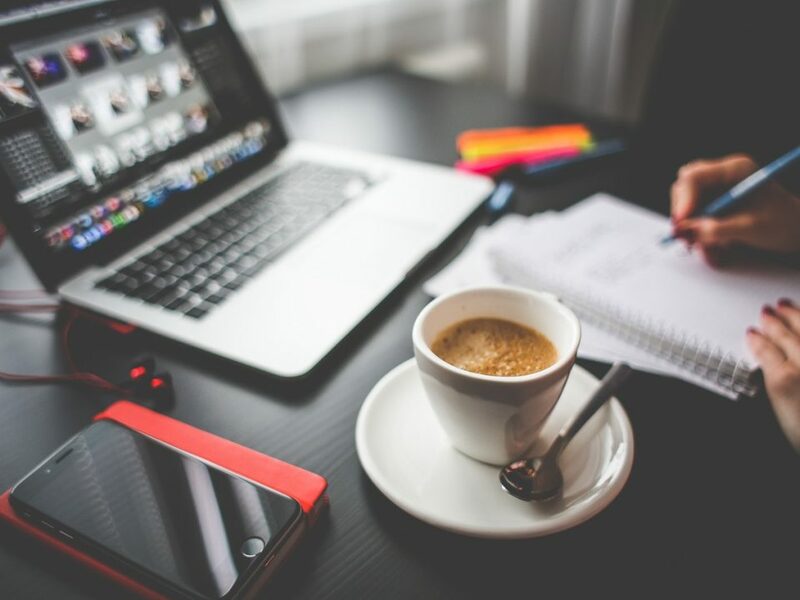 Feel free to check our blog post on ‘How to get a sim card in Iran’ to learn about getting a sim card with data for your stay in Iran.